Are You On The Same Page As Your Patient? Are you making your patients feel special? Are you making your long term patients feel extra special? 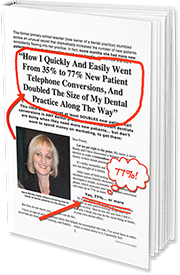 Many dentists create what they want to sell, instead of listening to their patients and creating what their patients want to buy. This makes life very difficult for both the dentist and the patient. The Dentist is thinking one thing while their patient is thinking something completely different. Dentists and their teams need to start listening to their patients and asking questions to get to the bottom of what their patients want and need. Patients are more likely to understand and accept treatment when you listen and find out what they want first. Once you are on the same page as your patient, you have an opportunity to present the treatment that meets their needs and more. When your patients have a desire then they are much more likely to accept the treatment you recommend. Making sure you are on the same page as your patient is the most important step in presenting treatment. This does not mean you only do the treatment your patient wants, it means you can now recommend what you know they need with the trust and confidence of your patient. Once your patient feels you are listening to them and they have not been heard this is when they ignore the treatment you recommend and even go to another dentist for a second opinion. Look closely at how you are discussing treatment with your patients. When you listen and understand your patients, they will listen and understand you and the treatment you recommend.